The U.S. Bureau of Labor Statistics reported on February 13th that the Consumer Price Index was unchanged in January. That is, CPI inflation was flat in January. In fact, inflation has been nonexistent for three straight months, i.e., 0 percent in each of the past three months. Over the past year, inflation has come in at only 1.6 percent. Tame inflation is good news for the economy and small businesses – actually for everybody. After all, high inflation is a tax that eats away at the value of the dollar. Periods of high inflation often tend to be times of significant inflation volatility. In addition, inflation hikes the real capital gains tax, given that capital gains are not indexed for inflation. 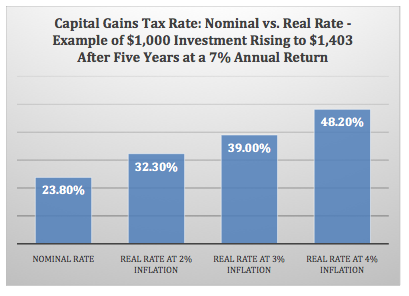 The difference between the nominal capital gains tax and the real capital gains tax at various inflation rates is significant, and is made clear in the examples offered in the following chart. By the way, as SBE Council has noted before, the difference between the nominal and real capital gains tax rate is a clear reason for indexing capital gains for inflation. Inflation also raises costs for businesses in terms of inputs, including labor. And obviously, high inflation hits consumers – such as family budgets – hard. So, when inflation is kept low, it’s a positive for investment, for entrepreneurship and business, and for consumers.